No experience necessary - Restorative Yoga is all about relaxing the mind by practicing gentle stretching sequences that will also make your body feel great. All levels and beginners are welcome. 6 people have already booked this trip! Our daily 90 minute classes will be focused on gently stretching and opening the body through a series of poses held for 5-20 minutes each, while also incorporating the use of doTerra Essential oils and smudging (purifying a room with the smoke of sacred herbs) to encourage relaxation. 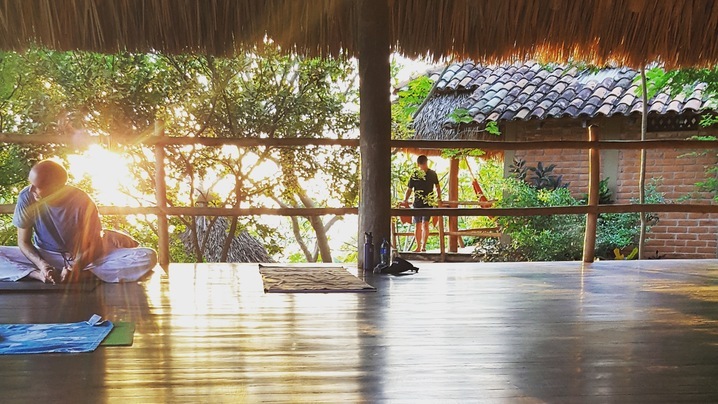 Join me for 7 magical days practicing yoga, enjoying $20 hour long massages, horseback riding, surfing or just enjoying the sights and the secluded beach! 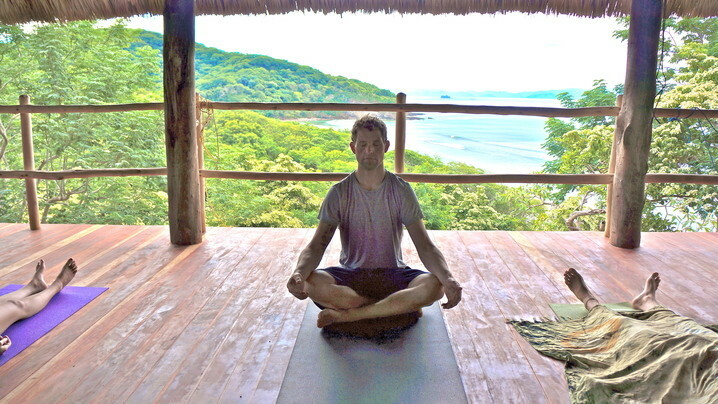 Costa Dulce’s yoga studio features stunning views and the soothing sounds of jungle and ocean. MONKEY infused yoga sessions have been known to occur. 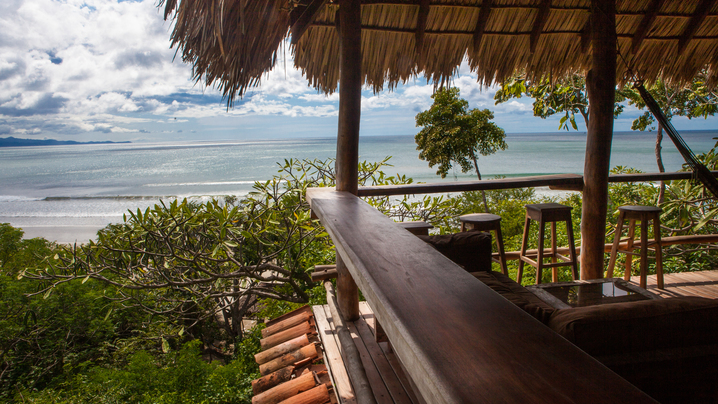 The 900 square foot rancho style yoga platform stands alone over-looking Escameca Nature Reserve and the beach. "Experiencing Costa Dulce with it's empty beach and amazing sunsets is really something you have to see to believe. With no other resorts or people around the days melt away and you are engulfed in complete tranquility and relaxation. It is an incredible feeling!" Daily 90 minute Restorative & Yin Yoga classes + Optional Open Practice on the Beach & Meditation by the Ocean. Free round-trip transportation to and from Managua Airport (MGA) is provided on the first and last day of the trip. It takes 2 hours 45 minutes to get to the venue from the airport. Not included: flights to/from Managua Airport (MGA) and travel insurance. Guests are responsible for purchasing travel medical insurance and cancellation insurance which are also not included. Singer is a certified E-RYT yoga instructor with over 1000 hours of teaching experience. In her hometown of Austin Texas she has owned her own art gallery and yoga studio, led several yoga retreats, and co-taught as a guest teacher for 200 hour teacher trainings. 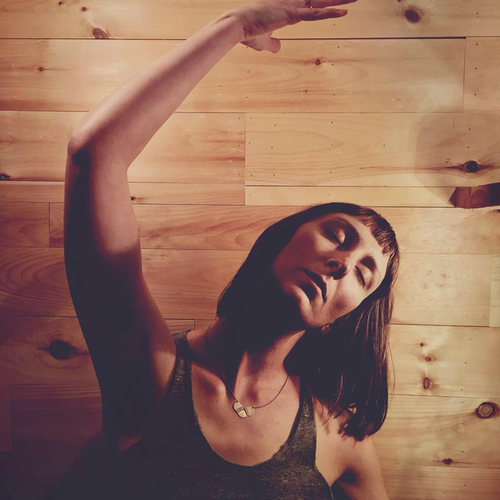 Singer's passion is teaching Restorative & Yin Yoga. Experiencing Costa Dulce with it's empty beach and amazing sunsets is really something you have to see to believe. With no other resorts or people around the days melt away and you are engulfed in complete tranquility and relaxation. It is an incredible feeling! 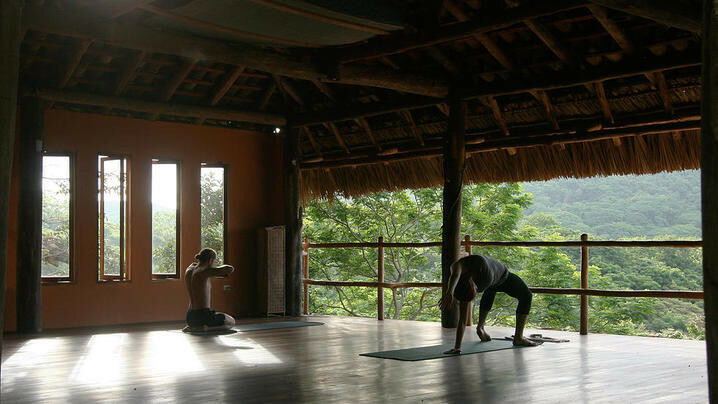 Costa Dulce’s yoga studio features stunning views and the soothing sounds of jungle and ocean. Monkey infused yoga sessions have been known to occur. 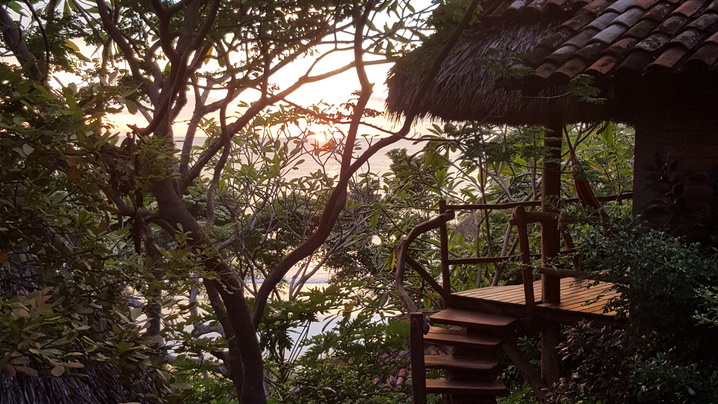 Our 900 square foot rancho style yoga platform stands alone over-looking Escameca Nature Reserve and the beach. It also doubles as an excellent event center. 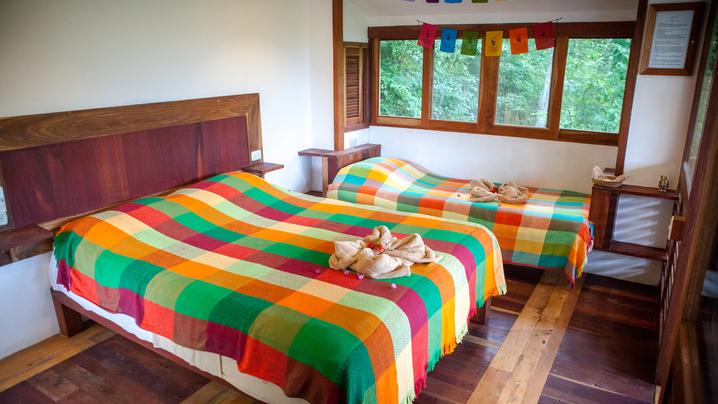 Costa Dulce offers full time, fully staffed kitchen and dining area the Dulce Cocina. Local, fresh, organic, and healthy food. Our focus is providing delicious, fresh, healthy food. Locally sourced and carefully selected. We are dedicated to both preserving and enjoying this special part of the world. Wanting to take action we have partnered with Proyecto Huella and have created a turtle hatchery. We have released thousands of baby turtles into the wild. We encourage groups to give back to nature by volunteering for this project. Challenged by the issues of living responsibly within our ecosystem, we are dedicated to exploring progressive architecture and alternative energy with an unyielding respect for the local environment. Solar powered and battery backup systems keep the lights on, the refrigerator cold and the showers hot when local power is disrupted. You can stay connected to the outside world with wi-fi and Skype. Yoga with Singer was awesome - daily restorative sessions to the sounds of the ocean and the wind through the jungle trees was truly unique. Costa Dulce beach was clean and secluded as advertised. Great place to unwind and just be a beach bum. Three meals a day were very filling and a nice variety each day! Would go back again. Costa dulce is off the beaten path and well worth the trek. Gorgeous beaches, quaint bungalows with amazing views, the food was fresh and healthy. Yoga with Cass and Caitlin was fun, relaxing and the views in the studio overlooking the ocean were like no other! Overall I had an amazing experience. The trip was amazing. I signed up because Asami is a wonderful teacher, and the entire trip exceeded my expectations. The yoga was a great combination of meditation, flow and yin, learning new postures and doing affirmations with partners. Costa Dulce was very accommodating for the airport shuttle, dietary restrictions (the food was incredible! ), and many different activities. It was just the right combination of high quality but laid back, activities to choose from but time to relax, nice rooms and bar/lounge, the waves and sunsets were beautiful. A couple we met there said they had stayed at other places in Nicaragua before Costa Dulce and there was simply no comparison. Thank you Asami, Kit and Tyson! Very nice location, closest thing to paradise. Staff, food and managers were great. Yoga classes with the very dedicated Asami were soooo cool and demanding at the same time. I can't see how a retreat could be better executed. Just one word: paradise. Thank you for an amazing trip! Absolutely incredible trip. 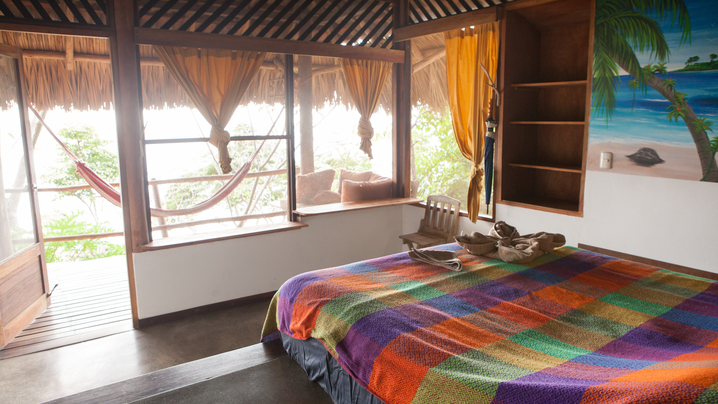 Costa Dulce is even more stunning than the photos and a perfect location for a retreat. All of the staff and owners are super helpful, approachable, and a pleasure to interact with. The proximity to the beach, views from the rooms and the yoga shala are second to none. Costa Dulce sits on its own private beach (which is massive) and offers plenty to do - from swimming, surfing, paddleboarding in the lagoon, reading in a shady hammock, horseback riding, etc. The food was amazing and they managed to accomodate an extensive range of food allergies/preferences and offered healthy, fresh meals. I would give the trip 6 stars if I could. The trip was amazing. Costa Dolce is a beautiful place, and the staff was great. I would recommend this place to anyone. We had an amazing time at Costa Dulce. The food and accommodations were excellent, and the staff were great. 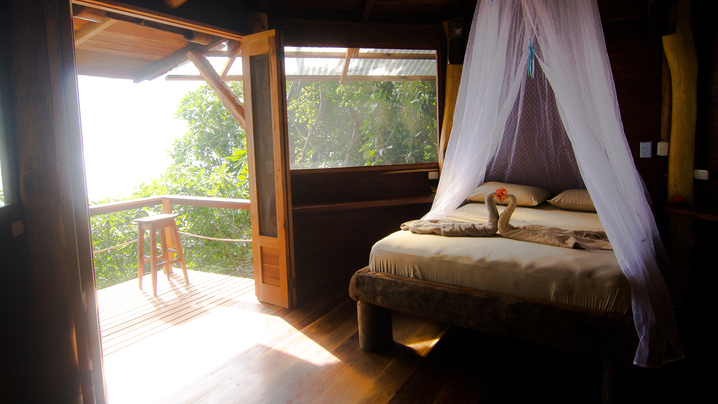 We so enjoyed the fact that it was an eco-resort and blended into the jungle and ocean surroundings. It was the perfect place to unplug, recharge, practice yoga, meditate and just relax. Definitely a special place! This retreat was amazing! Costa Dulce is a one of a kind location with an amazing staff. Also the food every day was super fresh and health. We all looked forward to the smoothie of the day each morning! This trip was absolutely wonderful. The staff at the resort was so friendly, the food was delicious, and the location was something out of a fantasy. Happy to have found this laid back resort. I would recommend this resort to anyone looking for a safe place to enjoy Nicaragua. The staff went over and beyond my expectations. Much to do or do nothing you will enjoy this place. My group and I loved Costa Dulce and the staff! The location was idyllic and I could not have asked for a better retreat venue and participants who joined. The retreat location was great, rustic, but that was to be expected. Food was fantastic, they were wonderful about accommodating dietary restrictions and the place was so relaxing. This trip exceeded my expectations in every way. Costa Dulce is a beautiful, peaceful place staffed with kind and caring people! Emma and Jess's yoga and meditation instruction was top-notch. We had a BLAST! My trip to Costa Dulce was incredible beyond words. From the location to the food, from the yoga classes to the energy of the city, everything was perfect. The location is beautiful and very rustic, the food was some of the best I've ever had--each meal was more delicious than the one before, and the yoga itself was absolutely amazing. Massages, surfing, and nature walks were wonderful too. Would recommend and definitely travel there again. The transportation to the hotel was easy to find and conveniently set up for us. Costa Dulce was not what I was expecting. I think I would have enjoyed it more if I had known what I was getting into, and would have packed very differently. It was more of a hostel on the ocean than a hotel. Small rooms with no locks, screen walls, and bugs everywhere. Some rooms had bathrooms, others you'd have to walk outside to get to the bathroom, and showers were shared by several rooms. No A/C and limited airflow in the rooms lead to hot and buggy nights. The meals were good, and what seemed to be authentic Nicaraguan food-very carb heavy and little protein. There was a super convenient 'honor bar' where you could get beer, wine, rum, or soda and charge it to your room. Massages were great, on site, and super cheap. Most of the activities were done by local contractors and very well done. Horseback riding was awesome. My group and ambassador was great, but have a few more creature comforts would have been appreciated. Overall the trip was amazing. I had a great time. Amazing, words are not enough to express the awesome experience! Great! Really lovely location and fun times in the sun! The location was spectacular! The staff at Costa Dulce were wonderful often going above and beyond. I enjoyed the Nicaraguan foods we were treated to for many of our meals. The activities offered were unique and so much fun! My only concern would be about organization/ communication of activity arrangements, whether regarding times, additional costs... Etc. Loved this trip, would do it again I. A heartbeat!!! Join Singer's Tribe and stay up to date on their trip!